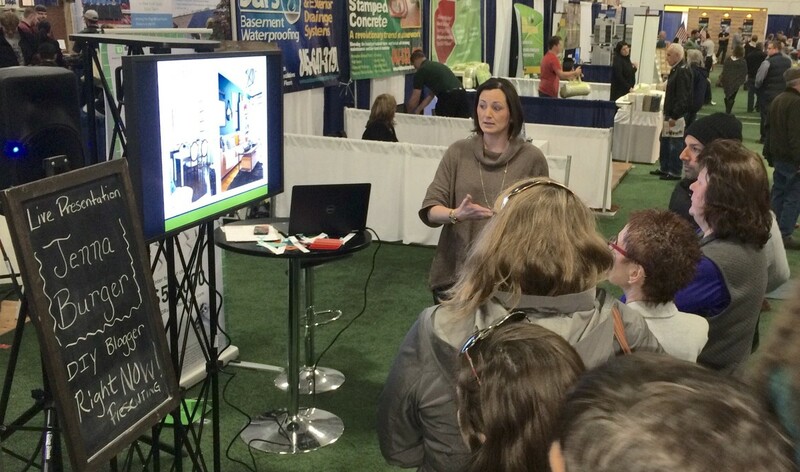 I just returned from a weekend away giving design talks at the Hudson Valley Home Show in Upstate New York. 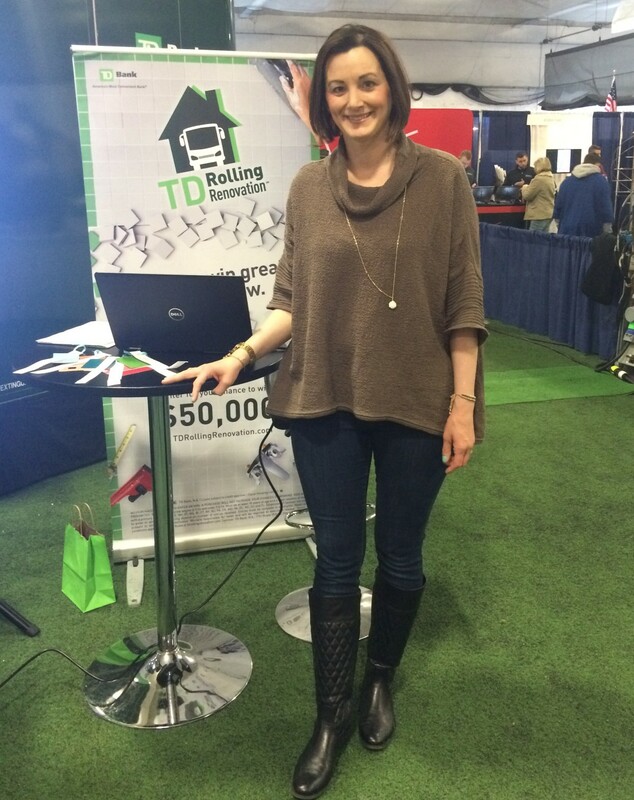 It was the second opportunity for me to partner with HGTV Magazine + TD Bank for their Rolling Renovation Tour which has stretched from Maine to Miami since February and will continue through June. For this design presentation + the previous one in Boston a few weeks back, I shared DIY ideas + savvy solutions to get the high end look for less. 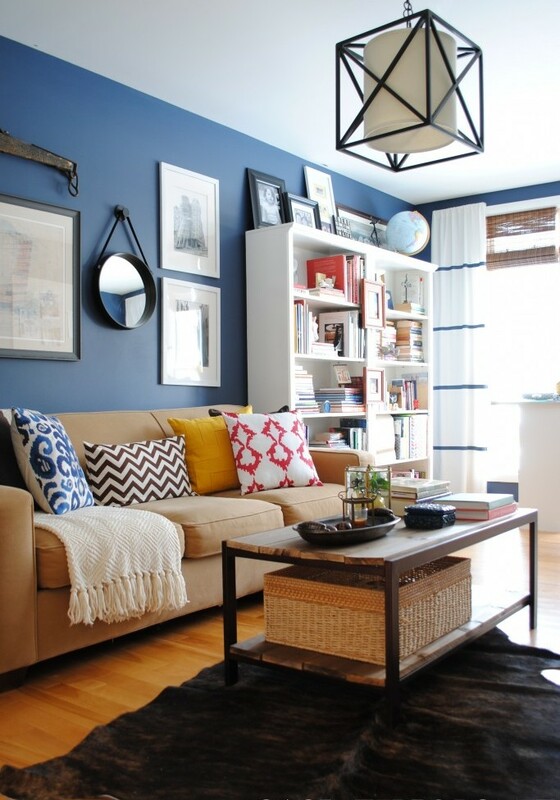 When wanting to revamp a space(s), start out by FINDING INSPIRATION. 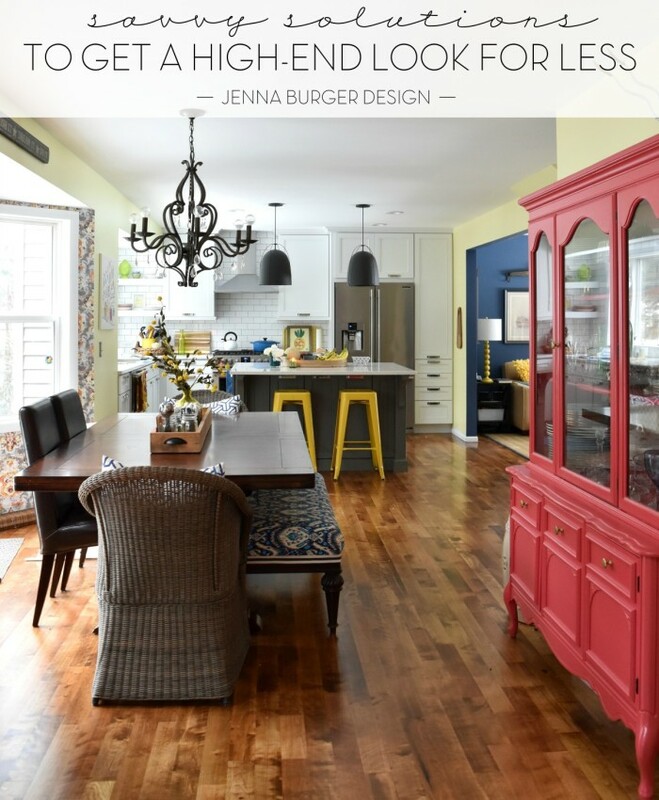 Flip through design magazines + peruse the web to gather spaces that you like and that you feel reflect your style. Start a board dedicated to the space(s) on your Pinterest account and pin things pictures that catch your eye. Search for spaces using key words that reflect what you like, ie: industrial, farmhouse, or modern. > What do you like about the space? With your inspiration in hand, establish a BUDGET. How much can you really spend? A few hundred dollars or a few thousand dollars? A range is fine, but knowing how much you can devote to the project will keep you on track. Then create a VISION BOARD. Big or small I put together a mood board / vision board for every project – personal and for clients. It keeps me on track when shopping to know what will work together and what won’t. 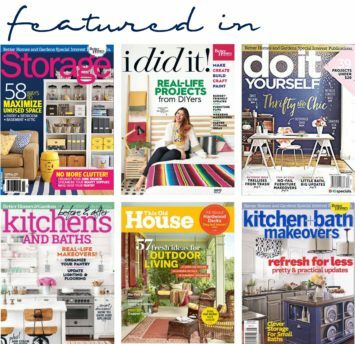 Referencing the vision board makes shopping easy to stay on track. Go through the space(s) and ask yourself piece by piece, is this worth keeping or should I ditch it? 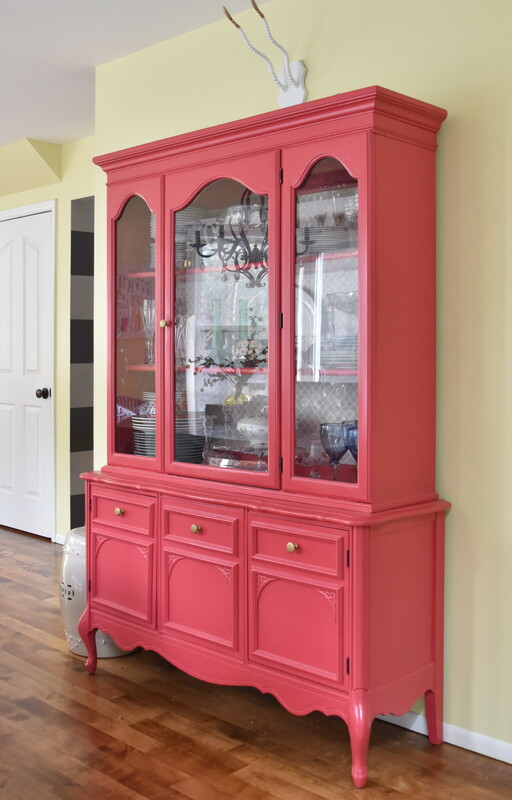 It can be difficult to part with things, especially when they are sentimental items, but if it doesn’t work for the space, it’s not worth keeping. Try moving the item(s) to another room OR give it to a friend or family member. 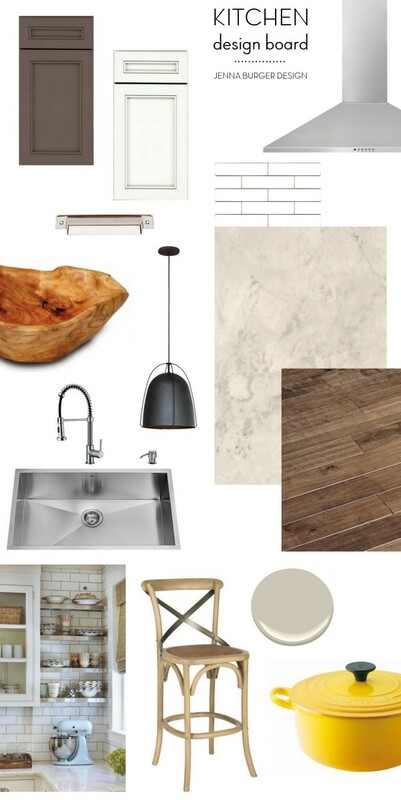 With inspiration + a plan in place, it’s time to execute the project and pull the space together to make it a reality. When the time comes to purchasing the items, my rule of thumb is to spend more on the items that will last and spend less on the layers. Items like a sofa, chair(s), or a rug that you want to ‘live’ for years to come, should be quality items. Then for the layers of pillows, side tables, and accessories, spend less. Those layers are necessary to give the room character, but they’re often items that you may want to change in a year or even seasonally. 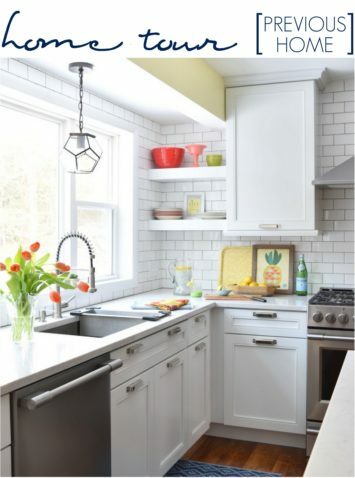 If you don’t spend a lot, then you’ll be more inclined to swap it out to get a freshened look. Tight on Budget? Make a statement. Choose one oversized piece as a focal point. 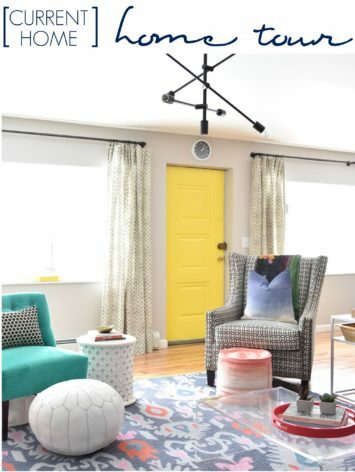 Try a vibrant wallpaper or oversized art or a dynamic light fixture. Those bold statement pieces will draw the eye in. IF YOU CAN’T BUY IT, DIY IT! One of my favorite all-time projects are the horizontal painted striped panels that I made a few years back for the living room. During the design process, I was drawn to this gorgeous space, specifically the long white panels with thick navy horizontal stripes. 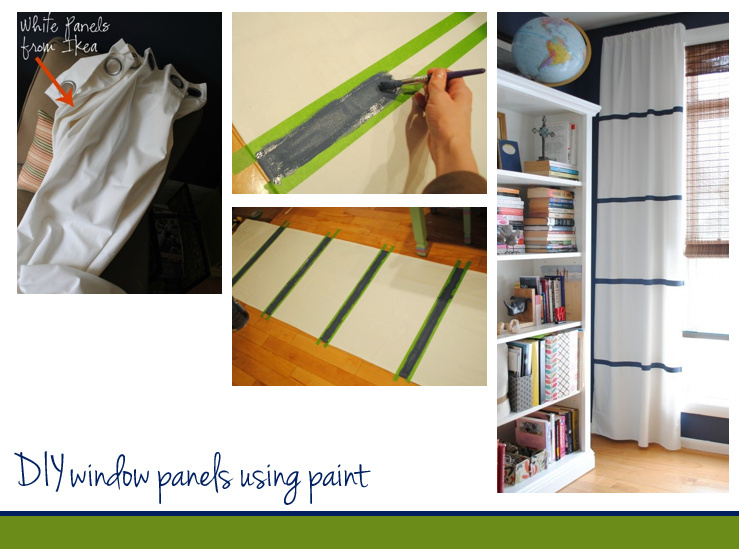 I achieved a similar look by adding tape to white cotton panels from Ikea and painting stripes using the wall color of the room. A few coats later and they were complete. This high-end look for less cost about $25. 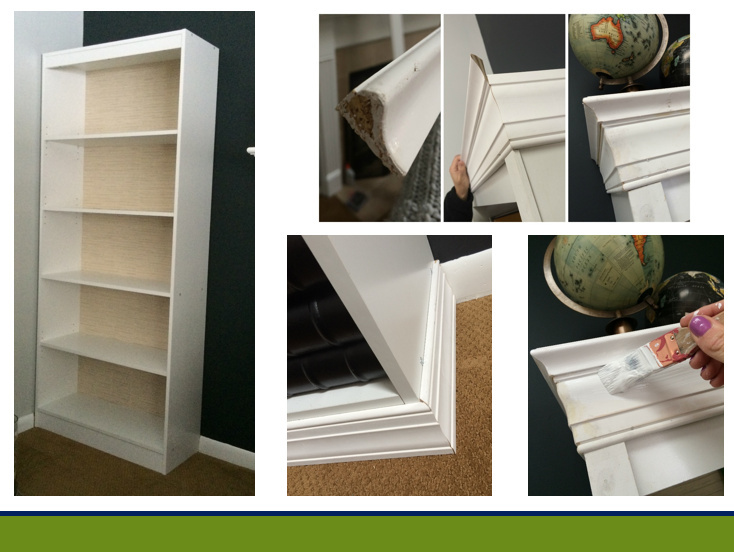 Another look that everyone wants in the home are built-ins, but most can’t afford the cost of thousands – myself included. When it came time to revamp our family room, I knew built-ins were the only answer for the walls at the sides of the fireplace. But how was I going to get the look but not spend thousands??? 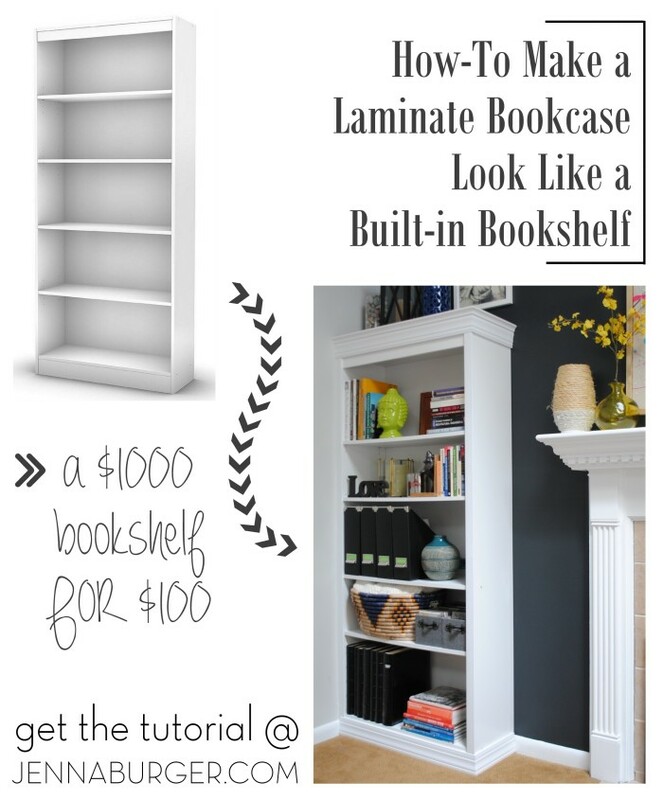 I chose to purchase $60 laminate bookcases and using stock base + crown moulding from Lowe’s, I was able to achieve a high-end, built-in look but at the fraction of the cost. One more big impact way to achieve the high-end look for less is PAINT! 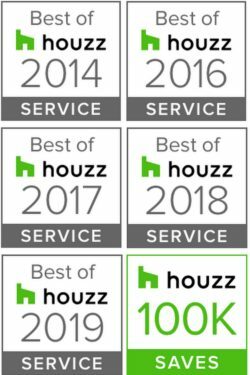 Whether a new splash of color on the walls or painting a piece of furniture, paint is probably the item that costs the least yet yields the biggest results. 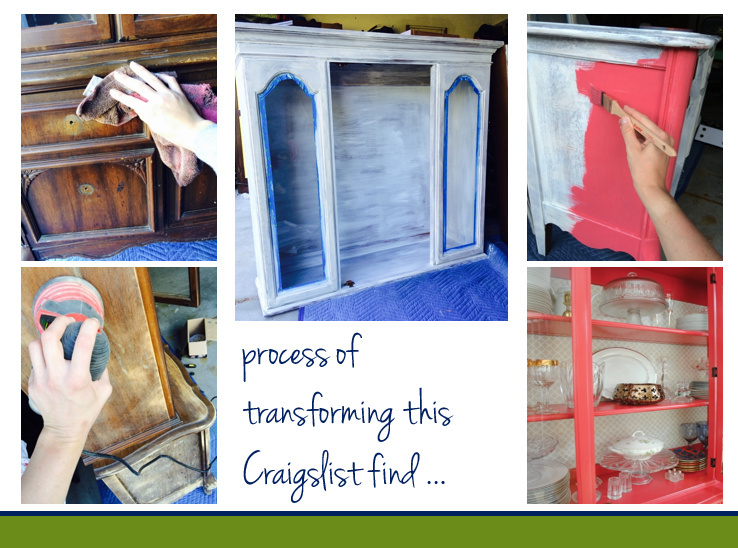 My favorite paint project ever… The raspberry china cabinet makeover. 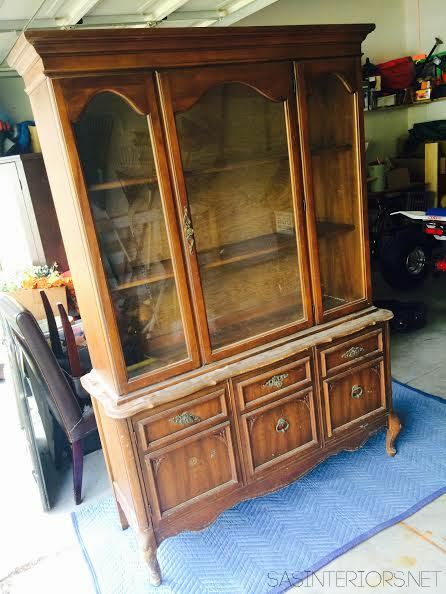 Remember when we snagged it off Craigslist a few years back? > Remove the hardware. Clean it up. > Prime the surfaces using a stain-blocking primer. > Paint using 3 coats of semi-gloss latex paint. > Finish with a clear coat of polyurethane in a semi-gloss finish. 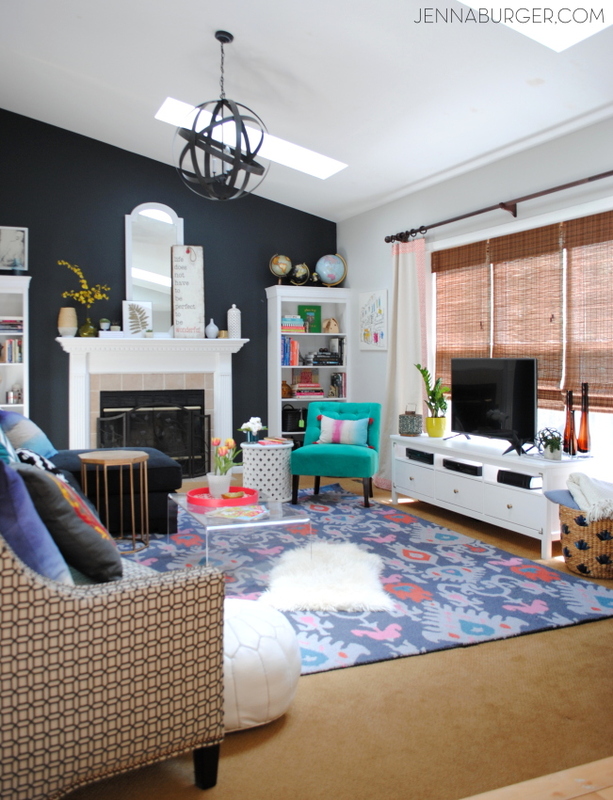 Achieving the high-end look for less isn’t difficult, but it takes time + focus. Find inspiration and create a plan before executing to keep you on track to make the best decisions that are right for the room. Can’t buy? DIY! 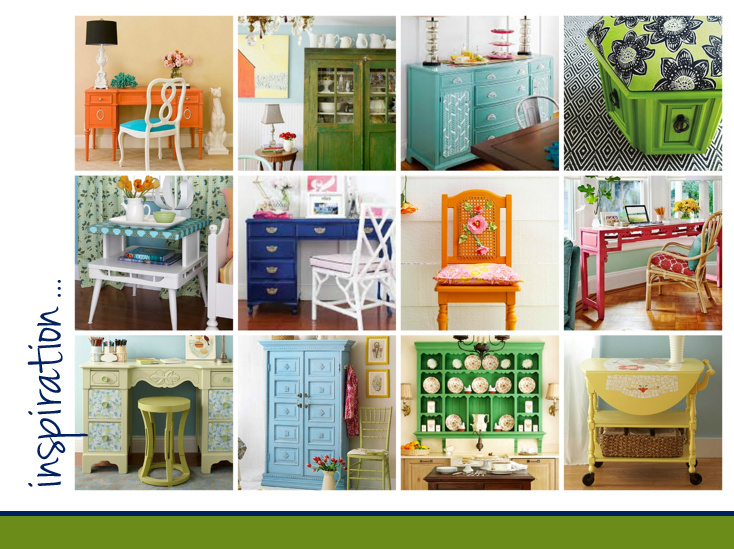 Integrate do-it-yourself projects to keep costs down and achieve the look you’ve always wanted.